I must admit I didn’t see it coming. Really, I was sure that last weeks’ picture would remain an uncovered mystery till the very end, but boy was I wrong. Melissa got it right! “This week is tricky though, but my gut instinct says seaweed.” It shows that we really should trust our instincts. The correct answer was seconded by Virtually Teacher. She wasn’t sure about her guess but she was also right. Have a look at the full picture. 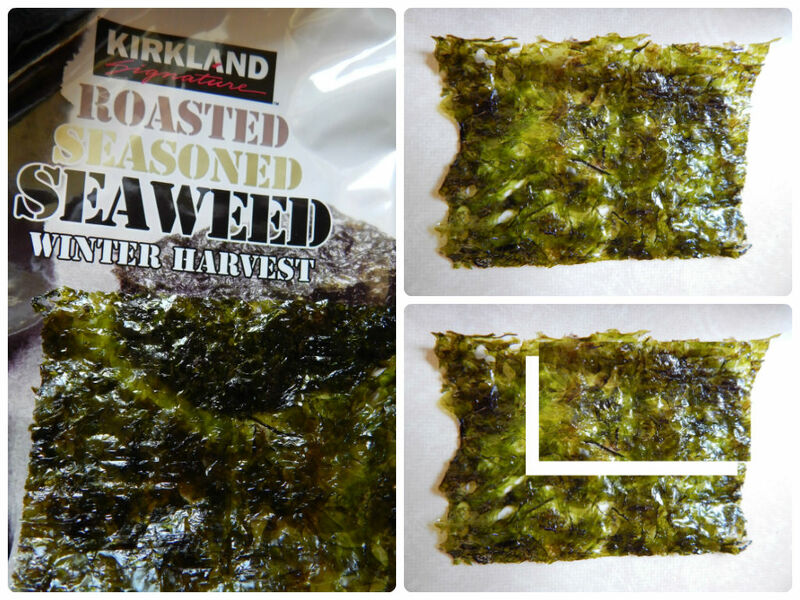 Every time we have a Chinese meal I will have some seaweed on the side – lovely and crisp, sweet tasting, so when I spotted a packet of seaweed in Costco I just had to try it. It doesn’t taste anything like the one I am used to eating. Its taste is much more algae like, much stronger and defined, but it is still pleasant and quite enjoyable. According to a Huffington Post article: Seaweed’s best-known benefit is that it is an extraordinary source of a nutrient missing in almost every other food: iodine. Consuming healthy levels of iodine is critically important to maintaining a healthy thyroid, a gland in your neck which helps produce and regulate hormones. A malfunctioning thyroid can result in a wide range of symptoms such as fatigue, muscle weakness and high cholesterol (to name a few). In severe or untreated cases, it can lead to serious medical conditions like goiters (a swelling of the thyroid gland), heart palpitations and impaired memory. But if you read the whole article you will discover that it isn’t all that good (just ten grams of Dulse, a type of red seaweed, has 34 times more potassium when comparing it to the same size serving of banana, which in turn can cause heart palpitations if someone has a kidney problem) or actually it is good but in moderation… like everything else I guess, including moderation. Have a great evening and enjoy your weekend! Posted in Who / What Am I? Bark TimeSeaweedWho / What Am I? I still don’t like seaweed. I have no idea what that picture is. Yeah, you are having a great running! and i love seaweed! from the picture it kinda look like korean seaweed? Oh Molly, you really know your seaweed! seaweed is my favorite <3 love this one snacks..
i love seaweeds and i buy it in packets ready to eat as snacks.. hmm, i think it’s a cat. It’s gonna be a sea creature. The eye of a cat? I really dislike the taste of seaweed. I’m terrible at guessing what the pictures are so I won’t both, lol. Looks like an eye of a white cat or maybe rabbit? Interesting info about seaweed. At first I thought cat but then thought maybe horse? lol about someone guessing the seaweed! Is this week’s an arctic fox’s eye?! hmmm… and eye of a cat?